Su Shi was born into a literary family in 1037. At the age of 19 he passed the highest-level civil service examinations with flying colors, and was marked out as a rising star within the world of officialdom. His lucid, eloquent essays greatly impressed Emperor Renzong (1010-1063) and by the time the young Emperor Shenzong (1048-1085) ascended to the throne in 1067, Su Shi was a respected figure among scholar-officials at court. “Today, Su Shi is recognized as one of the eight great prose masters of the Tang and Song, and one of the four Song masters of calligraphy. His poems, including At Red Cliff, Cherishing the Past and Prelude to the Water Melody, have become embedded in Chinese culture, inspiring landscape paintings and poetic illustrations throughout the Ming and Qing dynasties. His calligraphy has been copied, studied and collected for centuries. Note: The movie Red Cliff by Director Johnathan Woo is in our top 10 movies of all time. It is a two-part, four and one-half hours film. Everything about this film is stellar. From the story-line, casting, music and production. We cannot more highly recommend this film. Click here if you want to purchase a copy. Be sure to purchase the International version as the US version, as seen on Netflix, is a cut down 2 hour version that ruins the film frankly. Note: Similarly, English painter Lawerence Stephen Lowry, born in 1887, used only a five color pallet for his paintings. His use of ivory black, vermilion, Prussian blue, yellow ochre and flake white. Su Shi (1037-1101), Wood and Rock. Handscroll, ink on paper. “Wood and Rock is inscribed with the poetry of Su Shi’s friend Mi Fu (1051-1107), which was probably added at a later date. 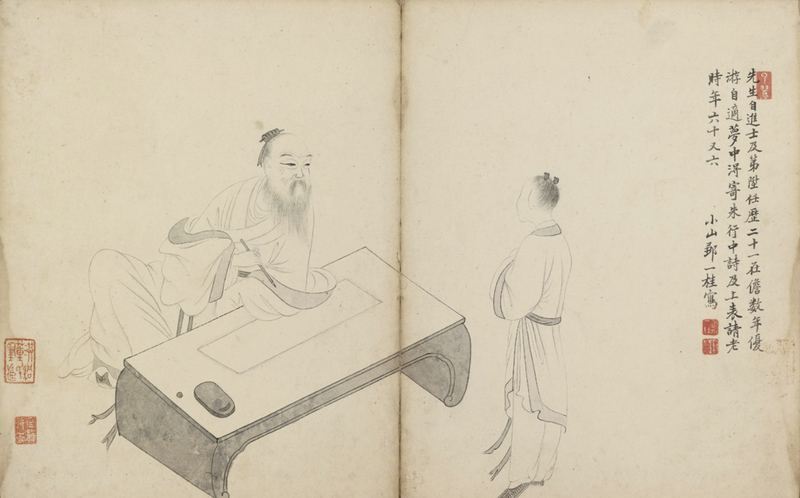 Like Su Shi, Mi Fu was a celebrated poet, calligrapher, painter and statesman. For Su Shi, expressing affinity through the giving and exchanging of painting and verse in the form of calligraphy was a means of building networks of cultural capital. The ink traces on this scroll offer insights into abstracted ideas of how Su Shi and Mi Fu thought and conceived of art, but also illuminate how these exceptional men of the 11th century understood each other. They are, therefore, tangible representations of the relationships between cultural giants of the distant past. This 1,000 year old scroll was recently auctioned at Christie’s in Hong Kong. It sold for HK$ 463,600,000 or approximately $59 million USD. By the way, both Su Shi and Mi Fu were crazy about rocks and wrote essays on rocks. Mi Fu was called Crazy Mi for he bowed to a beautiful rock and called the rock his elder brother. Yes, that is true. There is also some other wonderful stories about them both. Here is a photo of a painting relating to your note above. Thanks to Chris Chochrane, he noticed I picked up the wrong price for the scroll. This correction has been noted in the updated post. Thanks Chris!